Dental implants are an excellent way to replace missing or severely damaged teeth. If you are looking for the most stable, natural, and long-term solution to missing teeth, then dental implants may be ideal for you. 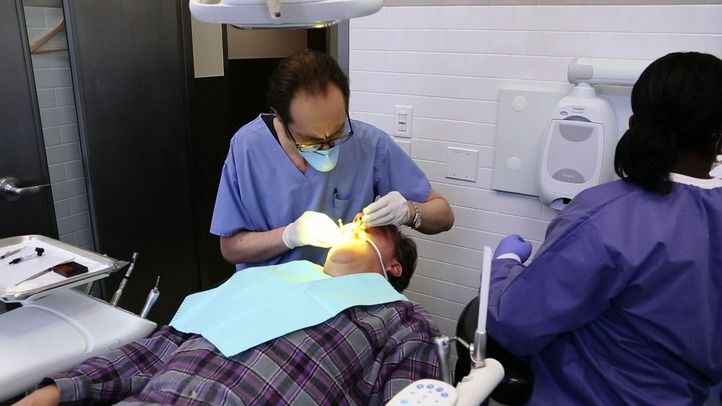 Our Manhattan, New York dentists have more than twenty years of experience restoring health, function, and beauty to patient’s smiles using dental implants and dental prosthetics. Our implantologists can give you back the freedom, independence, and confidence that go along with having a mouth full of healthy teeth. Dental implants are small titanium posts designed to replace lost tooth roots. They provide the very best support for dentures, crowns, and bridges, allowing these restorations to function as comfortably and efficiently as your natural teeth. Placing dental implants requires two procedures. During the first procedure, the implants are surgically placed in the jawbone. Over the next three to six months, the implants will fuse to the bone. Once this fusion is complete, your restorations will be attached to the implants, and you can begin smiling, speaking and chewing with absolute confidence. Recent advancements in implant technology have provided a solution to single or multiple tooth replacement and denture stabilization. In fact, new technology allows our experienced dentist to install “mini dental implants” in a single visit to our Manhattan, New York practice. These implants are every bit as strong as conventional implants, but more cost-effective and simple in their design. Mini dental implants can be placed within about an hour by Dr. Scott Fine, one of the area’s leading implant experts. Because this cutting-edge solution to missing or extensively damaged teeth is milled in-house in our state-of-the-art laboratory, our smile specialists can deliver the same life-changing results in a fraction of the time and at a lower cost. Mini dental implants are smaller in diameter than dental implants, ranging from 1.8 mm to 2.9 mm. Dr. Scott Fine is a conservative implantologist. He believes that while dental implants are a great solution for many patients, they are not ideal for everyone. Also, many oral surgeons don’t take into account the dexterity of the jawbone, the growth direction of the teeth, the curvature of the smile, and a patient's overall health prior to installing dental implants. Because our Manhattan, New York restorative dentists take all of these factors into account when developing and customizing each patient’s surgical plan, patients are more satisfied with the outcome of their surgery. Since the 1980s, Dr. Fine has been at the forefront of dental implant surgery and has adapted new techniques that make oral surgery safer, less painful, and more predictable. His surgical skills, knowledge, and extensive experience set him apart from other implant dentists in the area. To learn more about dental implants in Manhattan, New York, including whether they are right for you, contact Fine Dental today. We understand the commitment required to undergoing dental implant surgery. Our team will be here for you at every stage of your journey.